Mithril has been with the Archive for an awfully long time, and while her gallery isn't as enormous as some other folks' here, it makes up for that in sheer stunning quality. 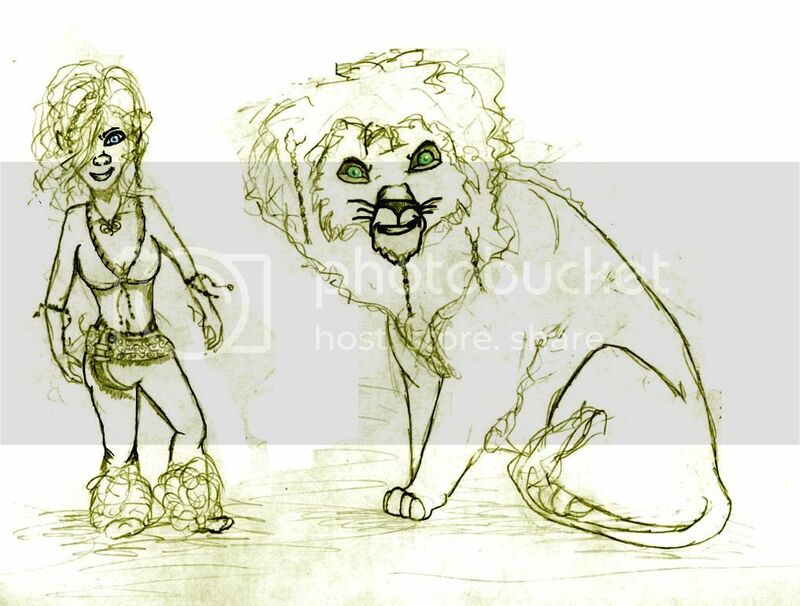 Even from the earliest days her creative output has been impressive, with vibrant emotionality and a keen eye for color, not to mention a wide range of interests that keep her engaged in a great many worlds and universes, some more tangentially related to The Lion King, others anchored far away from it. Her interests keep her busy, but her active mind is always at work, and she's not hesitant to tell us everything that's on her mind—for which we can all be appreciative. First of all, I want to thank all of you who voted for me. Not being as active her as I used to, I had given up on ever becoming AotM. It is such a great honor to be chosen, I was absolutely gob smacked when I saw the e-mail from Brian. And it's fantastic to be the third potato up here! So a big, BIG hug to everyone of you! My little adventure here started way back in 2005. My parents wanted me to get a hobby, and after trying out several that didn't really stick because I got bored or it was too easy, they were getting quite nagging. I decided to do something that I found so difficult it would take years before I got any good, and therefore chose to start doing the one thing I actually loathed: drawing. You know when you're little and you have that one friend that's always better than you at drawing? Well, I had several of those. And being of the competitive nature that I am, I never wanted to draw because I didn't feel I was good enough. Getting quite desperate to get my parents of my back, I started searching for ideas on how to start; how on earth do you begin learning something you have knowingly neglected for so long? You find inspiration from your favourite book. I stumbled upon a little gallery displaying these wonderful, humorous and fantastic pictures of Harry Potter fanart, and later found out that the artist that had created this immensely inspirational pictures, actually had started out here. Her name was Makani. Her art led me to the TLKFAA, and all the great memories from my child-hood came flooding back. Lion King has always had a very special place in my heart. Being poor growing up, it was the first movie I ever saw at the cinema. It left such an impact on me, and I still cry during Mufasa's death-scene. After lurking around for a couple of months, I quickly found out what a "fursona" and OC's was, made up story-lines for characters not yet fully developed and filled my favourite artist list with people who had amazing talent, some of whom I'd later become friends with. I then uploaded my first picture, which can be seen in all its glory here: http://i1348.photobucket.com/albums/p739/MithrilArts/elflion_zpsfcdb7666.jpg , complete with overused Photoshop-effects and all. An early rendition of Mithril and her faithful feline. My gallery quickly filled up, however, I discovered that my past would eventually come back to haunt me. I didn't feel good enough and compared myself to others. This is something I believe all artists go through several times along their artistic journey. I remember I hated my art and deleted almost half my gallery in frustration. Then I was given some fatherly advice: If you want to eat an elephant, you first have to cut it up into little pieces. I realized that art has such a vast area you can discover. When you're good at something, you can always get better. When you feel competent with realism, you can always try some cubism or abstract art. Eventually I decided it would be a good idea "to cut the elephant up into little pieces" and start improving on three things: rendering, anatomy and and realism, completely ignoring things like expressions and backgrounds. Things got easier, I didn't put myself down when the background didn't look right or the expression wasn't made out of Disney-quality. It eventually led me to developing my own, distinct style, and people started noticing and my confidence grew. With more art and confidence came support. Support is so important to an artist, and I have still not found a place that gives you more encouragement and inspiration than this place. And support often came from people who I later became great friends with. Some where people I looked up to from the beginning, some started out the same place as I did and some had already come a long way. I would never have been here if it wasn't for all the comments, faves, watches, gift art and random acts of love from people I hadn't even talked to yet. I appreciate every single one so much. So thank you. Another piece of fatherly advice was: dream big and dream small. I always dreamed of becoming the AotM, and I will shamefully admit that I have even rehearsed this speech in the past. I dreamed of becoming a game designer, of reaching 100 watchers, getting to know some of the artists I looked up to. I also dreamed that I should at least try, in each drawing, to make it a bit better than the previous. If not, the next one. Set the bar high, but you should also set it on a level you already now you can reach. I hope my journey so far has given you some inspiration to continue on yours, even on the bad days. Do things that you love; I love giving and making people happy. I know the more effort that I put into a picture, the more it will be appreciated, and that is one of the many things that keeps me going and pushing myself. You can always reach your goals, just don't think of it as a solid space of time filled with hours and work between where you are now and the goal at the end. Look at it as a journey! Sorry for the long post, as some of you already know, I get quite passionate when I talk about things I love. In the end I would really like to say thank you all again, and especially thank you Brian for providing me and so many others a wonderful place full of memories and a strong foundation that has been able to give many young and aspiring artists a secure beginning to their own artistic journey. Thank you. Artists like Mithril have a lot to teach the rest of us. They've been down the long road of self-discovery and personal artistic development, and they've learned the hard lessons that many new artists have yet to understand are just part of the rite of passage of learning what art is for. Mithril is plenty lucky to have found the inspiration to bring her to the important realizations she has imparted to us: that art is a subject far, far too big for anyone to grasp all at once, or to become good at instantly. But no matter how big something is at first, if you tackle it piecemeal, finding areas where you can shine, and then building upon them as your experience grows, you can find yourself miles down the road before you know it. It's difficult to believe, looking at her already-stunning first few pieces from nearly ten years ago, that Mithril really was brand-new at art at the time. Some artists really are that lucky. But no matter how much natural talent you start out with, there's always a long way left to go. Not even professional Disney animators would describe themselves as being "done learning". Most, in fact, discover that the better they get, the more there is to the art world that they'd never even considered mastering. The world of creation just keeps getting bigger and bigger the more you discover of it. And for some artists, Mithril included, that's the marvel of it. It's fascinating to see how many genres Mithril has dabbled in over the years, mastering just about every one that she's set in her sights. Fandoms as disparate as Tolkien and Harry Potter and Pirates of the Caribbean, anthropomorphics and animals and fantasy creatures (many on display on her DeviantArt page), all inspire her to excellence through the sheer joy of creating. And fortunately for those of us who prefer to stick around here, a great deal of her art is still focused on The Lion King and its related subject matter—including tutorials that she's put together to teach something of the lessons she's learned the hard way to other up-and-coming artists who are on the same path she's on, and perhaps soon to be hot on her heels. But it's not a race. Mithril knows that as well as anyone. And her being so accomplished should never be a discouragement to other artists, but rather an inspiration: that this is where you can be if you learn how to cut up that elephant into bite-sized pieces, and don't be daunted by how much of it there is. Congratulations, Mithril, on this well earned recognition!